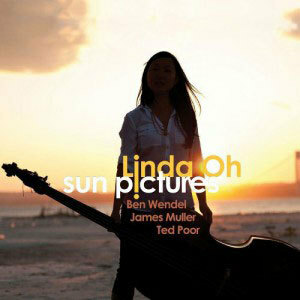 The title of bassist-composer Linda Oh’s third CD refers to the oldest remaining outdoor movie theater, located in her former home country of Australia. But Sun Pictures is also an apt description of her seven original songs, which are gently upbeat and airy, often composed as sonic snapshots inspired by artwork or settings from her travels. Thus “Footfall” depicts walking through autumnal snow in Eastern Europe, “Blue Over Gold” plays off a Rothko painting and “Terminal 3” was germinated by a late-night layover at JFK International. What the scenes have in common is a clean matte, and the straight-to-two-track music from a consistent quartet with no guest stars is likewise well delineated and unhurried. Fellow Aussie James Muller captures this delicate spirit, one that is simultaneously wistful and perceptive, with his guitar phrases, frequently in tandem with saxophonist Ben Wendel. At a time when Oh is in vogue due to her high-profile membership in bands led by Dave Douglas and/or Joe Lovano, her decision to release this understated charmer is a sign of confidence and commitment to her own muse.